We all sit with bad posture sometimes. But is this harmful? If we don’t sit well – symmetrical, with good back, shoulder and neck posture will this cause problems for our body? The short answer is – probably yes! Especially if the same bad habits are happening day after day. When our muscles and joints move into asymmetrical, awkward or cramped postures our body’s soft tissues will be compromised – stretched, pressured, compressed, not receive enough blood. To make the situation worse, these positions can happen for many hours, every day, for years. Bad habits. It’s easy to get into bad habits but hard to break them! Sometimes a bad habit starts because of a specific situation but the habit stays. Too much sitting. Our bodies are designed to move. When we are stationery for long periods of the time the body sends messages to the brain to move – so we do – but only within the constraints of the chair and desk. So we can end up in strange sitting postures. Fatigue and tiredness. Leaning forward on the desk, leaning onto one armrest, sliding the hips forward on the chair and reclining are sitting postures caused by fatigue or tiredness. These can happen more at the end of the day. If you find yourself in one of these positions, try getting up, going for a walk, stretching and moving. And make sure to get up from the chair more often over the day. Unsuitable or uncomfortable chair. If the chair seat size or backrest shape is not a good match for your body’s needs the body will often try all kinds of postures in the attempt to get support and comfort. Try adjusting the chair or change the chair. Armrests. Armrests can encourage leaning to one side. Fixed height armrests which don’t fit under the desk can cause many bad postures, like leaning forward to reach the desk top items or dropping the chair height to get the armrests under the desk. Needing foot support. If your feet are not reaching the floor your body will do all kinds of things to cope with this. This can include perching on the front of the chair, crossing the legs or hooking the feet over the chair base. If you need a footrest, get one! Remember though, not all footrests are the same. The best type have a comfortable carpet or rubber surface and height adjustability. Incorrect position of items on the desk cause problems. If you move into poor sitting positions when you start keying, reading or writing it is likely that the cause is the position or arrangement or your keyboard, printed material, phone etc. Having some difficulty seeing things on the screen. If you find yourself peering forward (with your back peeling away from the backrest), it can be because things on the screen are difficult to see. Things you can do include; moving the screen(s) closer, using enlarge or zoom, and managing glare or reflection issues. Get your eyes checked, or make sure your glasses suit screen work. Desk height. A desk which is too low for you will cause you to lean down and forward. This is a common problem for tall people. Dropping the chair is not a good solution because this will bend the knees and hips too much. Raising the desk is best. Correct workstation ergonomics are important to ensure good sitting postures when working. This applies even if you’re using a great chair! 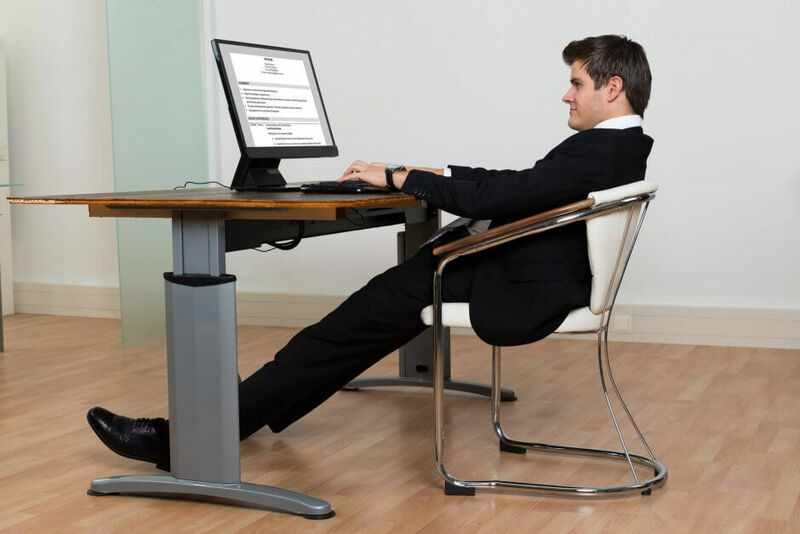 Get a workstation assessment if you think that your workstation is causing your poor sitting postures.